Take a look as we list the best players over the age of 30. These players still represent their clubs, and despite being deemed “old,” have been performing outstandingly well. Whenever a footballer passes the age of 30, we usually say that he is in the dying stages of his career. People claim that they will never achieve anything more than they already have. But, this common trend has been absolutely shattered by these five players. Football as we know it, has been evolving ever since its invention. Young players are always keen and eager to prove themselves to their coaches, hoping for a first team chance. But, we don’t usually concentrate on the older players. The older players have to maintain an impressive record for their current club, or they risk being benched in favor of younger and more vibrant players – who have much more time ahead of them. Clubs these days prefer to bring in young players, rather than an older player who will soon retire. Once a player turns 30, it could mean that they have nothing more to give – they have already passed their peak. Take a look at the 5 players who we think are still progressing and can further improve their abilities despite their old age. 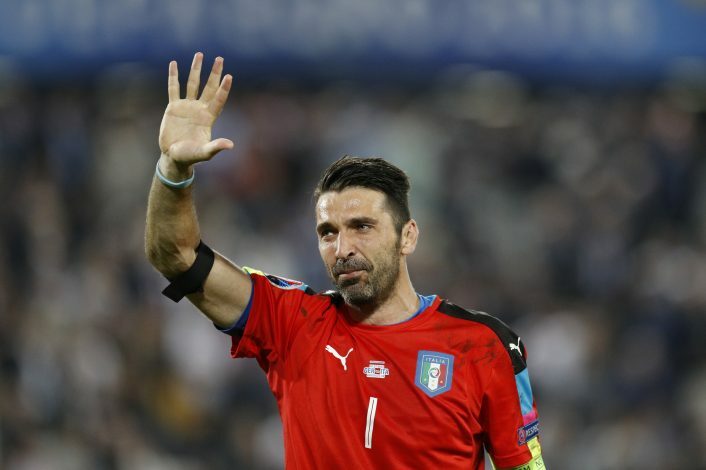 Buffon is a name that most of our grandparents would recognize. The Italian legend has a career span of over two decades; having started his career with Parma in 1995 and joining Juventus in 2001. He has racked over 750 games in his career. He even stayed with Juventus when they were relegated in 2004 – a true character of loyalty. His consistent performances throughout his career have managed to gain him the respect of many big names in football, who regard him as one of the greatest ever. We picked Buffon over Casillas because he is older and has been quite consistent compared to Iker. The German dwarf – as he’s known – Lahm is one of the best full-backs of his generation. He started off in Bayern Munich’s youth academy and worked his way up to become the captain of Bayern Munich, as well as the former captain of the German national team before getting retired from International football. He led Germany to the 2014 Fifa World Cup, and Bayern Munich to two Champions League triumphs. Lahm, even at the age of 32, is renowned for his pace and stamina as well as his tackling abilities – which makes him the perfect right back in our over-30 squad. The dynamic Dutchman, Arjen Robben, has been a man of action over the years. From his deadly left foot to his immense pace, and his winning mentality – this guy has got it all. Arjen Robben is also the captain of his national side – as he is a great leader. It is surprising to find that this man is already 32 years old. Arjen has already showcased his craft at the world’s best clubs – Real Madrid, Bayern Munich, PSV, and Chelsea. The Dutch winger has played over 500 games, scoring 180 in the process. Arjen Robben looks destined for further glory. He is playing in the German Bundesliga, for possibly the best team in the world. This means that if he continues in Germany, he will maintain his form and go down and one of the fastest players over 30. The Portuguese maestro, best in the world. Words need to be created to describe just how great Cristiano Ronaldo is. His rivalry with Lionel Messi is unlike any other in football’s history. Ronaldo began his career in Lisbon, joining the Sporting CP’s youth squad, after impressing in a trial match. He soon worked his way to the first team, where he played just over 20 matches and scored 3. Soon, his amazing performances attracted the attention of Sir Alex Ferguson, who signed the young Ronaldo for just over $15 million – making him Manchester United’s first ever Portuguese player. During his time at Manchester United, the Portuguese man perfected his skills, with massive practice and exposure to world class players like Ryan Giggs and Paul Scholes. Ronaldo made his way to the first team, and soon became an expert at free-kicks. He won his first Ballon d’Or in 2008, winning the UEFA Champions League in the same year as well. In 2009, Cristiano Ronaldo broke the world transfer record when Real Madrid signed the winger for a massive £80 million (since surpassed by Gareth Bale). He continued his impressive performances for Real Madrid, winning another 2 FIFA Ballon d’Or awards in the past years. At 31, the Portuguese star doesn’t look like he will be slowing down anytime soon. He may continue scoring goals till he gets tired of it. There are still good 7-8 seasons left in Ronaldo, during which he will continue to grow his massive talents. Zlatan is possibly one of the greatest players of all time. The giant Swede has got it all – great dribbling abilities, strength, winning attitude, and most important of all, a massive ego. Zlatan is never afraid of a challenge. Growing up in the rougher parts of Sweden, he was always meeting people who questioned his footballing abilities. He sure did prove all his doubters wrong. He has played at every major club in Europe – Ajax, Juventus, Internazionale, Barcelona, AC Milan, PSG, and now Manchester United. Zlatan has always voiced his opinions and doesn’t give a damn about what reporters think. His flamboyant style of scoring goals and massive influence on the pitch already speak for him.